The Minister of Foreign Affairs, Shaikh Khalid bin Ahmed bin Mohammed Al Khalifa, today received the Ambassador of Australia to the Kingdom of Bahrain, residing in Riyadh, Ridwaan Jadwat. 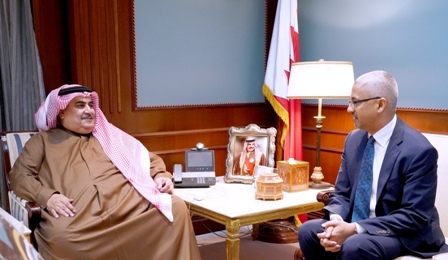 The Minister of Foreign Affairs presented the Ambassador a memorandum containing relevant court documents related to the extradition of Hakeem Al Araibi, including the international arrest warrant issued against him, in accordance with Articles 418, 422 and 425 of Bahrain’s Penal Code. The aforementioned convictions are the legal basis on which the extradition request to Australian authorities was sought by the Ministry of Justice through diplomatic channels. The Minister of Foreign Affairs stressed the Kingdom of Bahrain’s keenness to enhance bilateral cooperation with Australia, noting that such cases would not negatively impact relations between the two countries, which continue to develop in various fields. The Foreign Minister also wished the Ambassador further success in his efforts to bolster Bahraini-Australian ties, for the common interests of both countries and their peoples. For his part, Mr Jadwat expressed his appreciation for the opportunity to meet with the Minister of Foreign Affairs. The Ambassador also praised existing cooperation between the two countries, and wished the Kingdom further progress and prosperity.